After a whole year of working only with acrylic paints I am back to watercolours and lovin' it! From the moment the first brush stroke went down I said "Boy I really do like watercolours". They are great for travelling around as you need very little supplies to work with; two or three brushes, a few colours, a pencil and a sheet of paper. 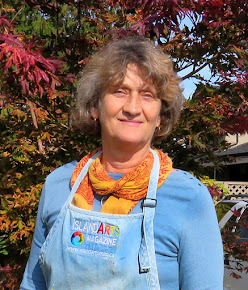 Plus if you are having a good day, you can usually complete a painting, or at least get a good start. 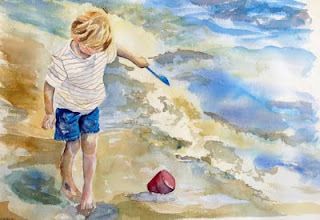 The first painting is of my nephew Zachery at the beach this summer. What I love about this one is that even though you can't see his face, if you know Zack, you recognize him right away as the "Boy at the Beach". I also love all the action going on in this painting from his left hand tossing sand from the shovel, the way his right foot twists and is buried in the sand while his right hand turns outward. The next image is called "No Gas Today". 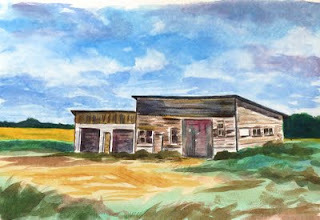 This is an abandoned gas station on a gravel road in Saskatchewan. I am sure it was quite the busy stop in it's day, maybe like "Corner Gas", but sadly not any more. 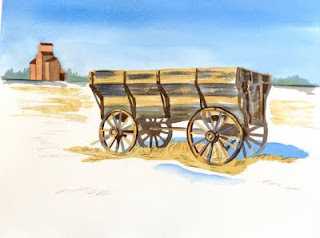 The next painting is called "Wagons Ho! ", another Saskatchewan scene. Both the elevators and wagons are becoming extinct in the Saskatchewan landscape. From the Prairies, to the West Coast ... and Beyond!